We’re thrilled to be featured in the Times, The Scotsman and The Herald business pages today which highlights our move from Glasgow to Kelso. We are really proud of our textile business, we’re driven to increase Scottish manufacturing while developing jobs in the local area. We’ve had fantastic support from Business Gateway and the Scottish Borders Chamber of Commerce this year and we are really excited for the future. A woollen hatmaker is hoping to bring more jobs back into Scotland’s traditional textiles heartland. Wonky Woolies has moved to larger premises in Kelso, in the Borders, and invested £50,000 in machinery to expand its product range. Alison Pottie, 36, founded the business in 2010 after taking up knitting as a hobby. The company initially produced handmade bobble hats but is now branching out into scarves and headbands. While the Scottish Borders is still home to several textiles manufacturers, many traditional weaving mills have closed in recent years. With support from Business Gateway Scottish Borders, the company is currently undertaking a growth and marketing strategy, with the aim of increasing sales by 30 per cent from both consumer and corporate customers. 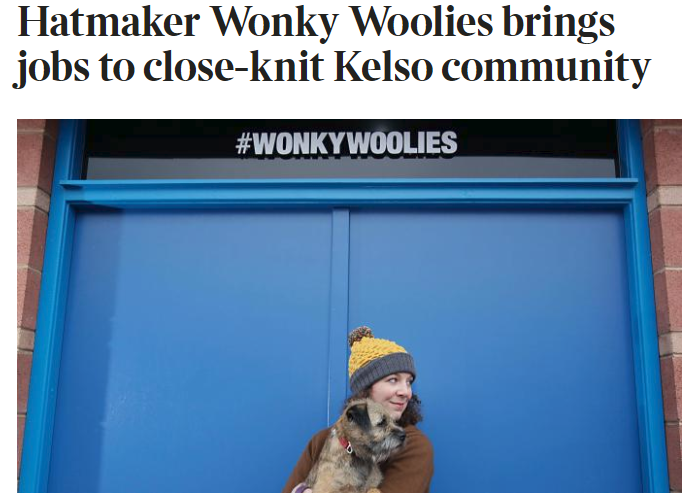 Wonky Woolies, founded by Alison Pottie, has had to move into larger premises in Kelso due to demand and now employs three members of staff and sells to customers across the UK. Sandra Campbell, of Business Gateway, said: “We identified that Wonky Woolies needed help around strategy and marketing that would allow the business to work to a defined and detailed plan. What’s next for Wonky Woolies? Well, this year we’ve created a brand new range of knitwear! We’re excited for you to see our full collection of bobble hats, beanie hats, scarves and headbands. Click on this link to go straight to the shop. We’d love to know what you think and we welcome all feedback. As a small team its integral to know your thoughts so we can continue to make the best products. If you’d like to leave us a review please do on our website or our Facebook page.